Since downloading the Bloglovin' app to my iPhone I've been loving sitting down with a cup of tea and getting cosied up reading blogs whilst the boyfriend nerds out on his Xbox. After all, isn't that what Sunday's are made for? My favourite at the moment has to be Nouvelle Daily. It has such a great mix of posts from beauty, fashion and lifestyle and some AMAZING recipes for sweet treats! 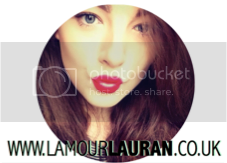 I really loved reading Laura's A Forte for Fashion blog through London Fashion Week. Her outfit posts were amazing(anyone who can rock a velvet suit gets a thumbs up in my opinion)! Chloé and BlushCrush were one of the first blogs I followed. She's a lovely girl who's recommendations I trust 100% and her writing style makes you feel like you're getting advice from your best friend. What are your favourite blog this month? Please leave your links below :) If you haven't already, I'd definitely suggest you go and download the Bloglovin' app from the AppStore, it's much more interactive and user friendly than Google Reader and it gives you the option to 'like' blog posts too (find my link below).